Unlike the trend of late, Microsoft has provided more than its fair share of glimpses and hands-on opportunities before the official release of Windows 8. Long before the release date of 31 October 2012, the public have had access to Developer Preview, Consumer Preview, Release Preview and RTM builds of Redmond’s revamped flagship OS. The OS has been available now for close to 4 months, with Microsoft ending their sale on upgrading from Windows 7 as of 1st February. It’s been a long time coming, but with the slew of reviews and criticisms for Windows 8 FoS decided to take its time to provide an analysis of Microsoft’s flagship OS. Has Windows 8 made its mark on the industry after a period of time on the market, and, more importantly, should you, as a Windows 7 user, upgrade? Before we get started, it’s worth noting that there’s an extremely long list of features, which may bury readers with unnecessary details. 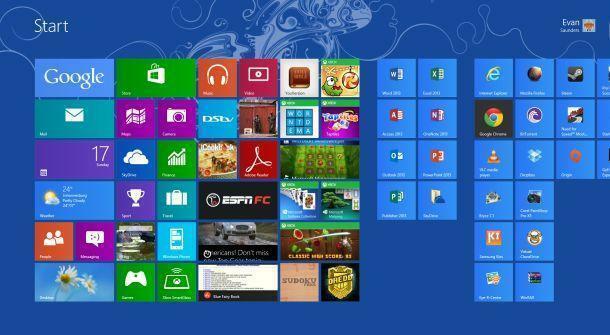 In addition, Windows 8 has been optimised for many different hardware from laptops and desktops to touch-based devices. We focus, thus, on the desktop/laptop versions. I can still recall having to install Windows 3.1 with a pack of around 10-15 diskettes, swapping between them as the installation required. The process of installing Windows 8 has been streamlined and simplified over that of Windows 7, making it easy for even the non-techno savvy users to get through. After a few clicks here and there, you can happily leave your installation running while grabbing a bite to eat, without needing to select additional options every 30 seconds. 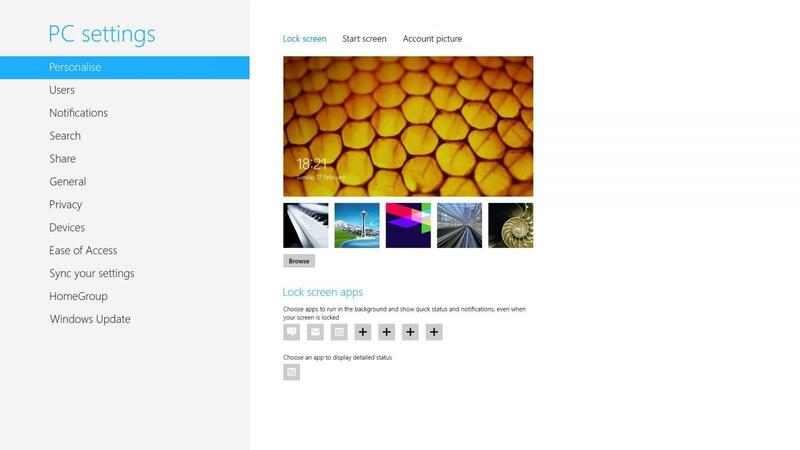 Once this has completed, you can now customise your Windows 8 experience with the standard theme selection and the likes. What’s good to note is that whether you’re upgrading or installing a fresh copy, most of your drivers would have been installed and ready to use. On first boot, you are greeted with the much talked about Metro UI. This is, by far, the biggest and most notable change in Windows 8. Gone are the days of the start menu and search box when hitting the dedicated Windows key on the keyboard. In fact, the start button on the taskbar has been removed altogether. A simple hover over the bottom left of the screen with your mouse unhides a pop-up image, which, when clicked on, opens the Metro UI as well. Microsoft has spent a great amount of effort in bringing the Live Tile menu to life. The live tiles show the latest information for supported apps, such as the latest news headlines, mails and Facebook updates. The most obvious reason for the change is due to the inclusion of the Windows Store, which will be discussed at a later stage. Despite all the debates and hatred for the Metro-styled menu, everyone will eventually become acquainted with it. Once you’ve become accustomed to the changes, you will realise that there’s a lot available from Windows 8 over previous versions. In the ‘start menu’ users are still able to search through the list of apps installed, even if they don’t support live tiles. Simply start typing the name of the software you installed and, as in the previous versions of Windows, it will show up on the screen. Additionally, the search is not limited to only apps, but can be setup to search through mails, settings and files, or by means of the other apps installed. 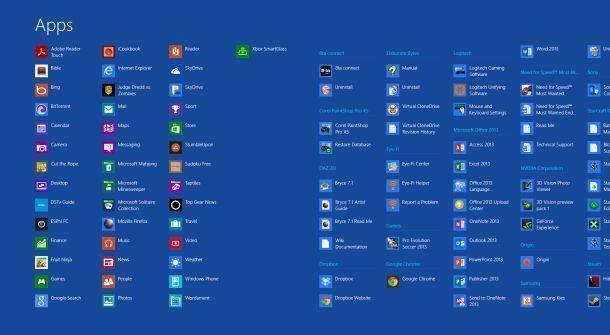 If you still haven’t managed to locate the app, users can right-click and select the ‘All Apps’ option to display a Windows 7-like list of installed software. Using the zoom functionality, via shortcut keys or touch screen (if available), users can zoom in and out to display all the pages of installed apps at once. Furthermore, users can choose which apps should be pinned to the Metro UI, as well as change the shortcut size. There are a number of other options and customisations for the Metro UI. The Charm Bar is a feature displaying shortcuts, which include Search, Share, Start, Devices and Settings in addition to the data and time, as seen below. To view the Charm Bar, users can scroll to the top right of the screen and slowly move to the bottom right. For touch-based devices, simply use the swipe gesture from the right to bring out this menu. 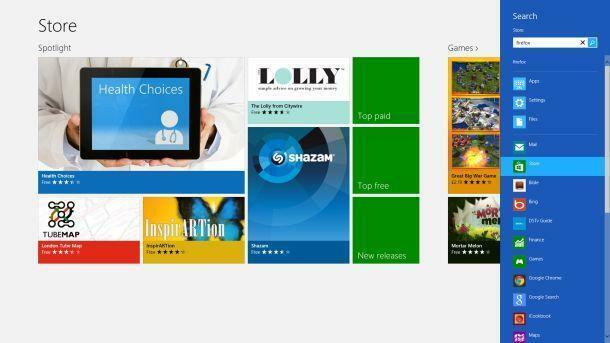 Although the Metro UI is the biggest change in Windows 8, it’s the Windows 8 Store that is the most exciting inclusion to the OS. The Store resembles the Xbox 360 Live Marketplace in its layout. If you’re accustomed the Live Marketplace, then there’s not much change for you. 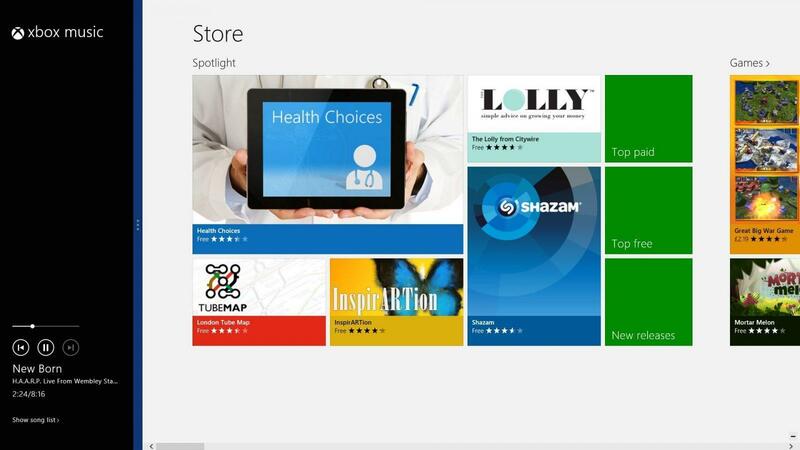 Upon first use, users will be happy to have noted the fairly populated Store with apps available for Windows 8. Each of the apps are categorised, making it easier to navigate through the long list of unwanted apps. The Store, however, doesn’t have its own, built-in search engine, but instead uses the search capabilities discussed earlier. Irrespective, the search functionality is easy enough to use and find apps you wish to download. 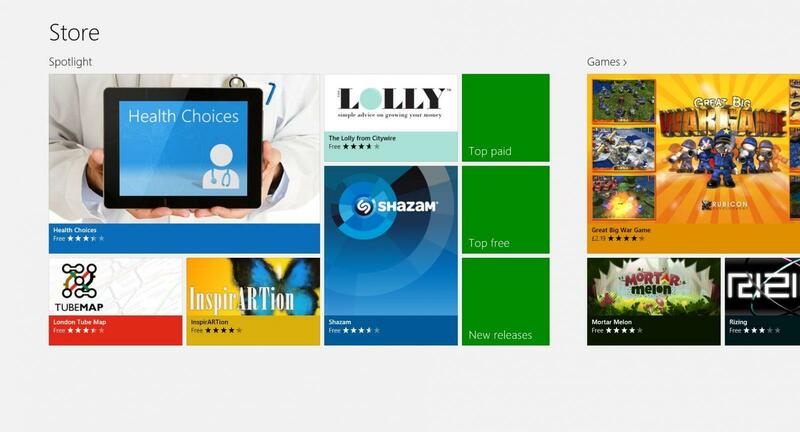 That being said, the Windows 8 Store isn’t as user friendly as that of Android’s Play Store and Apple’s App Store. Mail: Setup your live account, plus any additional email accounts. Calendar: Displays events, birthdays, etc. Weather: Displays the weather in your current area. People: Lists all your contacts from your added email accounts. Maps: View maps and directions around the world. Camera: Take photos from your device. News and Sport: Each app displays news or sport headlines for your selected region. Games: Similar to Live Marketplace from Xbox. Music: Metro UI form of Windows Media Player. Additionally, the list also includes Video, Travel, Finance and Bing Search apps. Despite all the trinkets in its software, Windows 8 also provides improvements in performance and hardware optimisation. From the outset users will notice a marked improvement in boot up time over their previously installed Windows 7. In some instances boot up has been cut by up to a minute, with an average time of 30 seconds from boot to the login screen. The way in which Microsoft achieves this is by means of partially storing your previous session on the PCs hard drive, much the same as it would during hibernation or sleep. Once you have successfully logged in, an addition 30-60 seconds will be used up before it is fully operational again. For those using SSD storage, there have been instances of boot ups as fast as 3 seconds, although I’ve never had the opportunity to time this. Multitasking has also been improved in Windows 8. When using Windows apps, you can easily switch between them by simply scrolling over to the top left of the screen, which shows next opened app in the list. Clicking on the pop-up image switches to this app, while scrolling down along the left, shows the list of other opened apps, which you’re able to select. When things become really interesting, user can also have both apps shown on screen at the same time. You can then choose which app should encompass the majority of the screen by using the proportion slider on the split screen. To close either of the apps, you can click and drag from the top centre of the screen and dragging it down. Using the same trick, users can also select which app they wish to use the split screen view with. Of course there are many other customisations and security options for users. In the Settings Menu, users can choose the type of login screen, the password type, other users, and a host of other options. Overall, the desktop should be something familiar to Windows users, as there isn’t much change in its look and feel. One significant change is the removal of the Aero UI, with Microsoft opting for a more minimalist look about it. 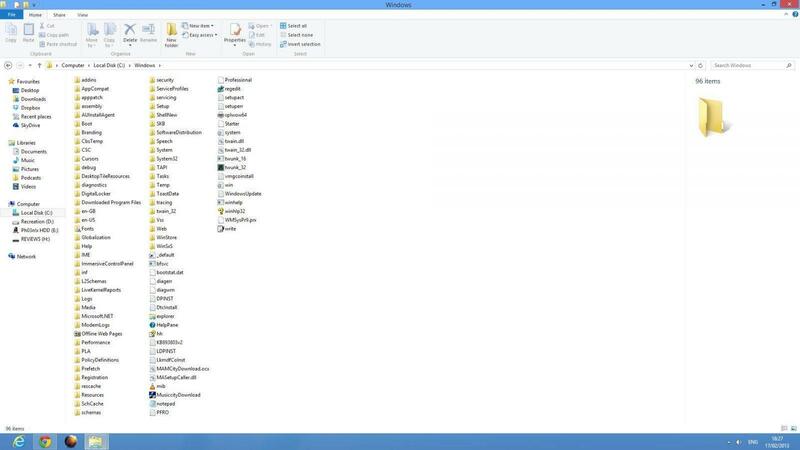 Windows Explorer is no more; at least in its naming. Now known as File Explorer, a few additions can be noted that can be found in the Ribbon UI, much the same as that found in Office and Paint. The File Explorer also offers a File History feature, which basically stores versions of the files, much like Apple’s Time Machine. 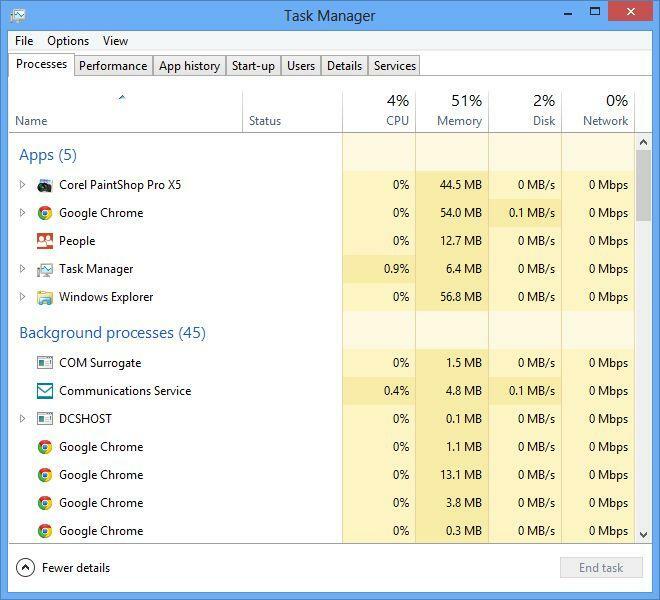 The Task Manager also sees a refresh. There are two viewing modes, simple and advanced, which provides details such as CPU, Memory, Disk and Network usage for each opened app and process. Windows 8 has improved multi-monitor support. Users with multiple monitors can now set different backgrounds on the different displays, have a single image span across various monitors, choose whether you wish to have the taskbar on one screen or many, and even set specific screens for which an app should always open to. With all the enhancements with multi-monitor support, a few of the newly introduced Windows 8 features seem to suffer most, with trickier user of the UI and Charms Bar. In terms of accessibility, Windows 8 offers a few enhancements for persons with visual, hearing and other disabilities. Improvements have been made to the Narrator with a new design and additional languages, and UI automation. Since its release, Microsoft has not made as great an impact in terms of copies sold for Windows 8 as they would’ve liked. Unfortunately, this is from their own doing. The release of Windows 7 was what the industry were waiting for since Windows XP, which wasn’t achieved with the problematic and resource-heavy Windows Vista. Because of this, and Windows 7’s user-friendly and stable build, the need to upgrade hasn’t been as essential. Maybe that was the plan of introducing Windows Vista all along. Windows 8 is a welcome upgrade, though, with optimisation for touch-friendly PCs, laptops and tablets. Windows 8 is utilised best when used with the users’ fingers. The upgrade, thus, would be more suited for those running on such devices, although isn’t entirely lost on standard devices. Although the capabilities are there to be used by means of the mouse, it sometimes feels clumsy and in the way when looking to perform other functions. With a host of new features, apps, and performance upgrades, there is a balanced mix of enhancements over Windows 7. The problem is that many users don’t need or use these in their daily lives, either at work or home. If you’re a power user, techno-savvy, or simply need to have all these features (whether you use them or not), then it’s definitely worth the upgrade. If you’re just looking to browse the internet, or update your Facebook status, however, you may want to think twice before opening your wallet. I love Windows 8. It’s a 4 1/2 from me.